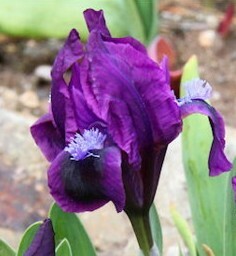 'Royal Wonder' (Carol Coleman, R. 2011) Seedling #07 MDB M-8C. MDB, 5.5" (14 cm), Early bloom. Standards royal red-purple, light navy veins, dark navy midrib; style arms medium red-purple edged ivory; falls royal red-purple, black spot below beard; beards gold in throat, violet blue tipped gold in middle, violet blue at end; slight sweet fragrance. Unknown I. pumila from Paul Black X 'Little Drummer Boy'. C. Iris On Pond 2013.